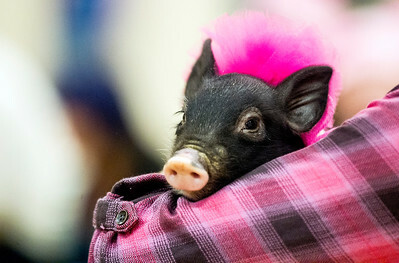 Sarah Nader- snader@shawmedia.com Social Studies teacher Joe Stimes has lipstick put on him before he kissed a pig at Riley School in Marengo Tuesday, March 1, 2016. Students were encouraged to fill up piggy banks belonging to the teacher that they wanted to see kiss a pig. 16 teachers participated in the fundraiser that raised $2,700 for the school. Sarah Nader- snader@shawmedia.com Top earner teacher Connie Marsh kissed an adult pig at Riley School in Marengo Tuesday, March 1, 2016. Students were encouraged to fill up piggy banks belonging to the teacher that they wanted to see kiss a pig. 16 teachers participated in the fundraiser that raised $2,700 for the school. 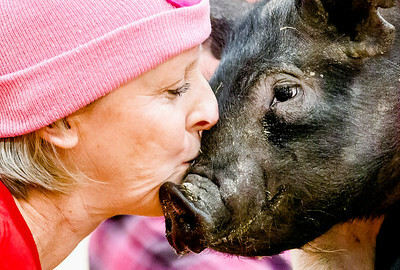 Sarah Nader- snader@shawmedia.com Sixth grade teacher Richelle Lagerstron kissed a pig at Riley School in Marengo Tuesday, March 1, 2016. Students were encouraged to fill up piggy banks belonging to the teacher that they wanted to see kiss a pig. 16 teachers participated in the fundraiser that raised $2,700 for the school. 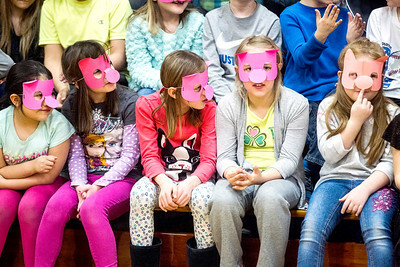 Sarah Nader- snader@shawmedia.com Students at Riley School school in Marengo wear pig masks while watching their teachers kiss a pig at Riley School in Marengo Tuesday, March 1, 2016. Students were encouraged to fill up piggy banks belonging to the teacher that they wanted to see kiss a pig. 16 teachers participated in the fundraiser that raised $2,700 for the school. 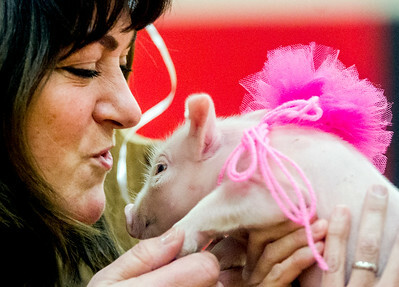 Sarah Nader- snader@shawmedia.com A piglet is held before teachers kissed the pig at Riley School in Marengo Tuesday, March 1, 2016. Students were encouraged to fill up piggy banks belonging to the teacher that they wanted to see kiss a pig. 16 teachers participated in the fundraiser that raised $2,700 for the school. 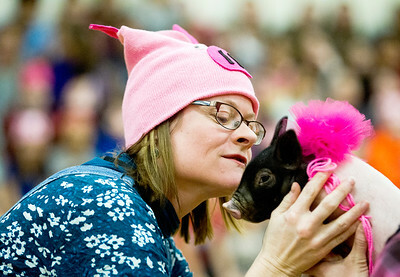 Sarah Nader- snader@shawmedia.com Speech Therapy teacher Rebecca Cosman kissed a pig at Riley School in Marengo Tuesday, March 1, 2016. Students were encouraged to fill up piggy banks belonging to the teacher that they wanted to see kiss a pig. 16 teachers participated in the fundraiser that raised $2,700 for the school. 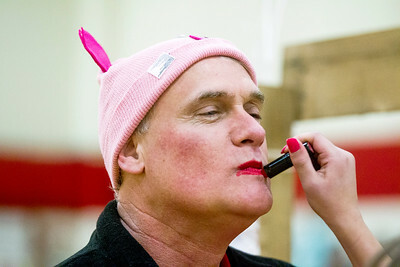 Social Studies teacher Joe Stimes has lipstick put on him before he kissed a pig at Riley School in Marengo Tuesday, March 1, 2016. Students were encouraged to fill up piggy banks belonging to the teacher that they wanted to see kiss a pig. 16 teachers participated in the fundraiser that raised $2,700 for the school.